Coaches have many responsibilities and one of them is to teach his infielders the Infield Strategy, which will be employed in certain circumstances and situations. Although it’s impossible to cover every possible scenario you’ll ever encounter, it’s important your players are familiar with the more common strategies which will dictate their positioning and responsibilities. Let’s learn infield strategies and the theories behind the moves, as well as the pros and cons of the different strategies. Some of these examples may seem quite simplistic and possibly quite obvious, but that’s because you already know and understand the principles explained, many coaches won’t because they’ve never been exposed to it, until now. First Baseman: The first baseman’s strategy is simply to hold the runner as close to the base as possible, preventing him from getting a large lead, with the intentions of either preventing him from attempting to steal, or giving his catcher the best possible chance of throwing him out should he try. Usually overlooked is the importance of holding the runner close in order to assist in completing a double play by delaying the runner from reaching second base, affording the defense additional time for the double play, or at least getting the lead runner out. Tip: Pitchers are trained to be as deceiving as possible with their pick off moves, because surprise is their only method of catching the runner napping or leaning the wrong way. Don’t you get fooled as well by coming off the base and into fielding position too soon. (1.) Throwing over to first base occasionally even if you don’t have a good pick off move. (2.) Varying the amount of time in between your pitches. Never get into a predictable routine or teams will run all over you. (3.) Simply hold the ball, which takes the spring out of the runner’s legs. (4.) Back off the rubber, forcing the runner to retreat back to the base. (5.) Vary your delivery, implementing a slide step delivery from time to time. Middle Infielders: The shortstop and second baseman are referred to as middle infielders and must perform as a single acting unit, similar to the Pitcher/Catcher battery, it’s imperative the shortstop / second base battery be on the same page at all times. They both will be playing at double play depth, possibly shading one direction or the other depending on the hitter’s history or how they plan to pitch the batter. They must secretly communicate between each pitch, which one of them will cover second base should the runner attempt to steal, as pitching location has a direct bearing on where the hitter will most likely hit the ball. 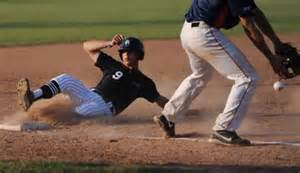 The secrecy is required in order to not give the opposition an advantage to call a hit and run play. Third Baseman: Due to his limited range, the 3rd baseman’s strategy is totally dependent on the score, current situation and the inning. 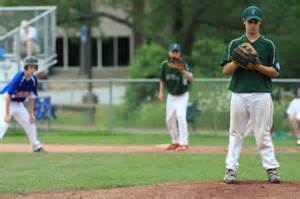 The start of the game to Middle innings he will play even with the base, off the line 3’ to 4’ however, he also must assess each new batter’s skill and speed as he must be aware of the surprise or sacrifice bunt, which will cause him to move forward a foot or two towards the plate. Again, depending on the situation, he’ll cheat towards the shortstop hole knowing the shortstop is playing at double play depth and he’ll have to field any slow bouncer toward shortstop hole. In the later innings, 8th - 9th and possibly 7th he’ll hug the baseline in order to prevent an extra base hit, as a ball getting passed him on his left, is a base hit, but one getting by on his right, will be a double with the hitter ending up in scoring position. Catcher: The Catcher is the conductor in this ballet, and as he controls what type of pitch is to be thrown, he must make sure his middle infielders can see his signals so they know the pitch, which in turn could affect their decision of who covers second base on a steal attempt. 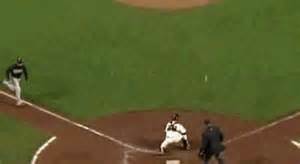 He can also see the runner on first and while the pitcher appears to be ignoring him, can either signal a throw over by the pitcher, a pitch out or throw behind the runner after catching the pitch. All of this is quietly happening between each pitch and the uneducated fan thinks the players are just kicking at the dust between pitches. Watch how this scenario will change defensive strategy with the number of outs recorded. Basic Strategy for Runner on 3rd base, representing the winning run, 0 outs. Using a MLB infield, which consists of grass infield and dirt base paths, for easy to relate to reference, the entire infield will be positioned very shallow. The third baseman will position himself @ 5 to 6’ in front of the third base bag and normal distance off the foul line. The shortstop will play shallow, even with the third baseman and on the fringe of the grass. 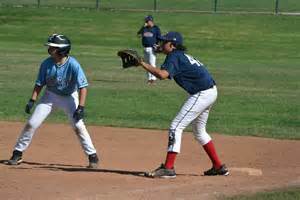 Because their throw to home plate is shorter than the right side of the infield, should the ball be sharply hit at them, they are to check the runner at third base, look him back to the base and make the out at first base. Should the runner commit to going home they will throw to the catcher. The right side of the infield, second and first baseman position themselves even closer to the plate than the left side infield, and the second baseman is several feet onto the grass because he has the longest throw home should the ball be hit to him. Figure 99% of the time, unless it’s a screaming line drive, any ball hit to the right side of the infield should be immediately thrown home, with no hesitation to check on the runner at third. Why? Runners are taught to automatically run on contact on any ball hit to the right side. All outfielders will play extremely shallow in order to have a chance of throwing the runner out after catching a fly ball. If a ball is hit over their head, the ball was hit too far for the outfielder to throw the runner out after tagging up anyway, so why bother. Same Situation EXCEPT the pitcher struck a hitter out and now there is 1 out. The Corners, third and first baseman continue to play shallow, as the third baseman can hold the runner, then throw to first for the 2nd out, or throw home should the runner try to score. The First baseman most likely must come home with the throw as the ball is hit to the right side and the runner should be running. The outfielders will remain shallow as their situation has not changed, they must try to throw the runner out at home plate. The pitcher struck out another batter and there are now 2 outs. Every fielder returns to their normal fielding depth in order to force a 2 out base hit for the run to score. These are but a few of the strategies you will learn in the series of strategies and philosophies.